Brian Atwood gives us a preview of the new models of pre-fall collection for the new 2012-2013 line B by Brian Atwood, the collection of economic and American fashion designer has tried to introduce last year because, according to his words, he wanted his creations were more affordable. Of course, not actually speak of models for everyone, in every case the B collection offers shoes at half price compared to the regular line, and despite this, many celebrities have sported the line B in spite of the success of the year dedicated to Maniac far more expensive. About some of the new winter. The new collection of pre-fall line B shows a series of models decolletes as always, right from the very special form and then get to choose colors and fabrics. Among the most characteristic that you can see better in our photogallery, we point out the Francoise pumps that we've been in the past interpreted in other clothes, with 15 covered heel and platform crystals of 4 cm. The model is available in beige suede and teal. Fabulous new interpretations of pumps Fontanne, decolletes which Brian Atwood is increasingly linked. 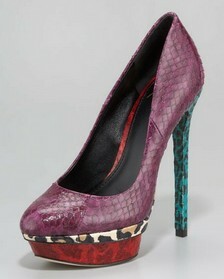 In winter keep their new look tall stilettos and big plateau outside, and are designed with alternating green reptile print in shades of plum, red and speckled pattern along the plateau. The Fontanne are made also in animal prints, while the new upper Frederique have colored paint and heels balanced by internal plateau 12. The preview of the pre-fall collection also includes models of peep-toe pumps in various materials, such as those in the beautiful magenta suede heel cigarette high plateau covered with 13 cm and 3 cm, then complete the form bead-coated crystals. More particular model is that of suede sandals Campisa proposed in beautiful colored blocks, covered heel, peep toe and outer side parts reptile print magenta, culminating in lower bands, t-bar and straps on the instep and ankle in orange suede. All variants have heels of 12 cm in the best case, which can easily exceed 15 cm, as in the case of sandals Frontera with their eccentric stylets of 15 cm balanced by external plateau and lists suede "naked" alternating with profiles in skin brown reptile.